The University of North Texas is the fourth largest university in the state. Although its current U.S. News and World report ranking is in the second tier of national universities, in 2013 the school was ranked as number 13 in the nation for the best online education programs. The University of North Texas was founded in 1890 as a teacher’s college; the university presently has 99 bachelor’s programs, 83 master’s level programs and 36 doctoral programs. There are ten colleges, two schools and an academy for early admission classes targeting high school students talented in math and science. Most classes at UNT have between 20 and 49 students and the student-to-faculty ratio is 24:1. The school has a global perspective and, to this end, it maintains several international alliances. One of the unique features of the University of North Texas is the UNT Discovery Park, which is a 290-acre that focuses on technology in science and engineering. The university is accredited by the Southern Association of Colleges and Schools Commission on Colleges. In addition, many of its programs carry specialized accreditation. Some of these accrediting organizations are: AACSB; ABET, including the commissions for accrediting computer sciences, technology, applied sciences and engineering; the Accrediting Commission for Programs in Hospitality Administration; the Accreditation Commission for Education in Journalism and Mass Communication; the American Chemical Society; the American Library Association; the American Psychological Association; the American Speech-Language-Hearing Association, the Association for Behavioral Analysis International; the Commission on English Language Program Accreditation; the Texas Educational Agency and the National Council for the Accreditation of Teacher Education. There are many more organizations that accredit programs at the University of North Texas; a complete listing of these is available on the college website. First year applicants to the university must complete the online application form. You must have graduated from an accredited high school or show documentation that you completed GED or an acceptable home schooling program. You are guaranteed admission to the school if you ranked in the top 10 percent of your high school class and submit your SAT or ACT scores. You are also guaranteed admission if you rank in the next 15 percent and have an SAT score of 950 or higher on the reasoning portion of the test, or an equivalent ACT score of 20. Even if you rank lower, you are guaranteed a place at the University of North Texas if your SAT scores are higher than 1050 on the reasoning portion or 23 to 26 on the ACT test. Another path of guaranteed admission is participation is the Eagle program which includes recommended and high-performing high school students. All applicants must submit the application form with the fee of $75. You do not need to submit any essays or letters of recommendation unless they are requested from you by the school. Graduate students complete the online application and submit it, along with their $75 fee and required documents. These documents include a transcript from all colleges they have attended, and the official results of graduate tests such as the GMAT or GRE. Graduate students are required to have a 3.0 GPA for a master’s program and a 3.5 for a doctoral program. In addition, the programs you are applying to may have other requirements such as letters of recommendation, resumes, portfolios or personal essays. Tuition at the University of North Texas is a combination of the state tuition and the school board authorized tuition. The average cost for Texas students living on campus and carrying 15 credits is $22,826 per semester. Non-resident students will pay $34,526. These costs are estimates and may not include some fees such as those for individual programs. Tuition for online programs is the same as for traditional ones except for non-residents. Since the university is not allowed to charge tuition to non-residents, schools may charge teaching fees. If you are a non-resident, you should check costs for your degree program. Financial aid is received by 74 percent of the student body. UNT offers some scholarships on its own, such as the merit scholarships, the Jaguar Cornerstone Scholarship, the Achievement Scholarship and others that are listed on the website. Many of these are competitive; some are needs-based and some are not. Private individuals often fund scholarships for people studying certain programs. In addition, corporations often offer scholarships based on contests or essays and professional organizations fund scholarships for people going into certain careers. After you have exhausted the list of grants and scholarships for which you qualify, you may consider student loans. Lending institutions offer these low-interest loans and defer repayment until sometime after graduation. Regular loans are also an option but at higher interest and you would have to make payments while you were in school. Another funding resource is getting a part-time job or doing work-study. 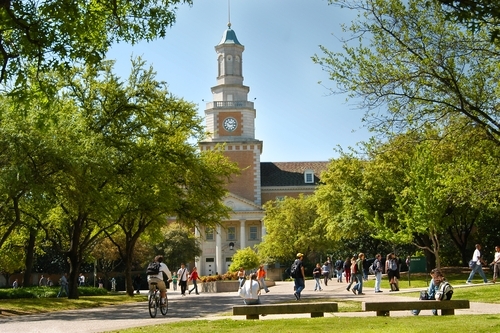 Among the forty or more programs online at UNT, the education degree is a popular offering. The curriculum is the same as for the traditional paths and you get the same degree. This is a teacher certification program that awards credentials in elementary, middle and secondary education as well as early childhood. There are teacher certificate paths in art at all levels; in early childhood through sixth grade; middle school, which is fourth through eighth grade and in secondary education. Some of the concentrations and majors available in these paths are implementation of technology in teaching, teaching children with special needs and meeting the educational needs of all learners, which is an important concept in this era of inclusiveness. A unique component of the online education programs is the Professional Development School. This is a two-semester program that allows students to gain self-confidence and a high degree of competency in a short time. Students spend two days a week the first semester of the school in direct “field experience,” and two days in the classroom. The second semester of the school is a fifteen-week internship under the supervision of a mentor-teacher. You can be admitted to the education program at the beginning of your junior year after completing general university required classes. If you want an online education program that will equip you to become a certified teacher, the University of North Texas may have just what you are looking for.